Summer Hours at the Robbers Library is an unexpectedly sweet and poignant story of a family of friends drawn together by accident and need. Kit is the reference librarian at the Robinton, NH public library. Sunny is a teenage girl caught and convicted of stealing a dictionary from a local bookstore. And Rusty is an unemployed Wall Streeter from New York trying to start over. When Sunny is sentenced to community service for her crime, she is assigned to be Kit’s assistant. Then Rusty begins spending long hours at the library, researching his own past in hopes of finding a path to his future. Over the course of the summer, the three of them find in each other the support they need to heal their own pasts, come to grips with their present, and possibly open a door to the future. We at Scintilla are HUGE fans of libraries, and we are especially blessed to live in the same town as Schlow Centre Region Library (https://www.schlowlibrary.org/). It is easy to see from this book that author Sue Halpern shares our love for the local public library. Public libraries are one of the last remaining free gathering places for communities. Our local library provides help for job seekers, daytime shelter from the elements for anyone who needs it, tax forms, computer access, board games and book clubs and children’s workshops and author talks and the local writer’s network. Oh, and books and magazines and periodicals and ereaders and on and on. All of it free to the user. When we visit, we see people who are studying, who are learning, who are playing, who are reading, who have come together with the amazing staff to create one of the best places to be in State College. I am writing this in preparation for National Library Week, and it’s fair to say that www.Scintilla.Info would be an impossible project without the help of Schlow. Words may be our stock in trade, but there simply are not words to express our love and gratitude to Schlow Library and every other library out there, serving their communities with love and faithfulness. The staff and patrons of the fictional library at the heart of this book are fun and funny, but they are fleshed out and real characters. We learn early on that Kit is fleeing the wreckage of a previous life, one that involved a marriage that ended badly, but we only learn the details gradually through the course of the book. Sunny is a homeschooled/no-schooled teen whose parents live as much off-the-grid as they can, and their reasons get fleshed out through the course of the book. “The Four,” a group of elderly men who gather every morning at the library to read the paper and gossip with each other, also figure prominently in the story. Nicknamed by Kit after the T.S. Eliot book “The Four Quartets,” these men take both Rusty and Sunny under their wings. Rusty’s own past as a stockbroker is more straightforward, but even he feels regrets about choices he made putting profits ahead of people. In its own way, the library becomes a place of healing just by bringing these people together and involving them in each other’s lives. The name “Robbers Library” is part of a joke by “The Four,” based on the original name of the library. It was named after its founding patron, a “Mr. Robers,” but as he was quite unpopular the name changed soon after his death. With Sunny’s petty larceny and Rusty’s background as a “robber baron,” the joke comes to include them as well in a friendly and affectionate way. The library was their library, belonging to all of them. Whoever had need, whoever had desire, the Robinton Public Library existed for them. That’s what libraries do. That’s what libraries are. 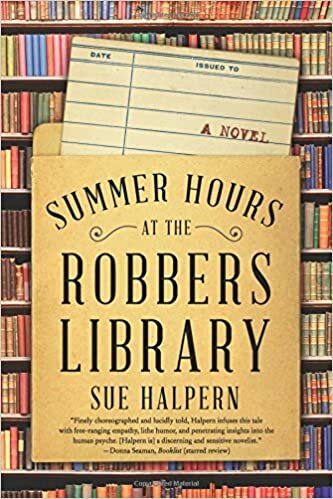 Summer Hours at the Robbers Library is a sweet book, not specifically about libraries, but more about the family and community that a library can create amongst those who love them. Kit and Sunny and Rusty become friends and then could almost be called a family of choice. As they fill holes life has opened in their lives, a story of love and healing takes place in the shadow of an institution that represents that opportunity as much as any place in a community. Regardless of creed, color, age, gender, or any other division, a library exists to pull us together.